The Super Bowl kicked off early and went into overtime for FBOs at Atlanta-area airports, requiring ramp reservations and slots for private aircraft during the Super Bowl TFR, January 29 through February 5. FBOs at the five favorites going into the big game—Hartsfield-Jackson Atlanta International Airport (ATL), DeKalb-Peachtree Airport (PDK), Fulton County Airport-Brown Field (FTY), Cobb County International Airport-McCollum Field (RYY), and Gwinnett County Airport-Briscoe Field (LZU)—racked up impressive stats, together handling more than 1,500 aircraft while hosting lavish parties and promotions. Double coverage was provided by support staff and equipment brought in from allied facilities around the country. In the end, the nine FBOs emerged victorious, though there were some complaints related to operators who reserved multiple slots. “We spent months and months putting the plan in place, and things stuck to plan,” said Shane Dale, FBO services manager at PDK’s Epps Aviation, the morning after the TFR ended. Epps handled more than 140 of the aircraft total. “Everything just worked like clockwork,” Dale said. As the closest airport to Mercedes Benz Stadium, site of Super Bowl LIII, FTY was a popular choice among the inbound and handled 15 to 16 arrivals and departures per hour during peak flows. Cost of reservations at the area airports ranged from about $1,500 to $1,700, in line with charges at recent Super Bowls. At PDK, arrivals for Atlantic Aviation, Epps Aviation, and Signature Flight Support, the airport’s three FBOs, were scheduled at three-minute intervals, and the airport drew 616 inbound turbine aircraft during the TFR, according to FlightAware. Atlantic Aviation showcased its just-completed $19 million FBO and hangar facility and hosted the first production Bombardier Global 7500 on the first stop of its world demonstration tour. All told, Atlantic handled 171 aircraft during the reservation period—124 of them on the ground at game time—and pumped 111,000 gallons of fuel. For backup, Atlantic brought in “extra fuel trucks, extra tugs, extra lav servicing equipment, ground power units, and potable water carts,” said Jay Hamby, Atlantic v-p of regional operations. Fuel uplift per aircraft at Epps Aviation was far above average, as almost all transients were large-cabin jets. Signature Flight Support, which also has facilities at ATL and FTY, hosted more than 200 aircraft at PDK, including drop-offs from NetJets, charter operators, and owners. 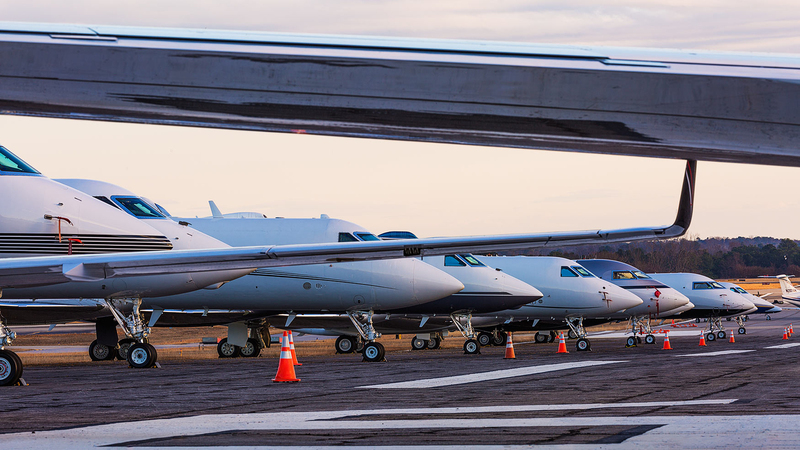 To alleviate ramp congestion, all three Signature locations offered parking and fuel discounts at its Huntsville (HTV), Savannah (SAV), and Charleston (CHS) locations to customers who repositioned jets there after drop-off. At both its PDK and FTY locations, Signature also offered shuttle service in Maseratis and displayed the Italian automaker’s vehicles on its ramp. The company also brought in Technicair teams to all three FBOs to handle maintenance and AOG events, said Patrick Sniffen, v-p of marketing. Signature’s ATL facility handled 161 arrivals and 187 departures during the TFR, the latter including Super Bowl-winning quarterback Tom Brady’s post-game flight to Walt Disney World. At Cobb County International, the sole international GA field, Hawthorne Global Aviation welcomed 354 jets, at least one from as far as Australia. Hawthorne took over the airport’s on-site restaurant, Elevation Chophouse & Skybar, to host a Super Bowl party and brought in 45 additional line service techs and 15 additional customer service representatives, said Bryon Burbage, Hawthorne president and CEO. At Gwinnett County, the two FBOs—Gwinnett Aero and Aircraft Specialists Jet Center—had more than 200 reservations going into the weekend. Aircraft based at the airport were consolidated in one parking area to free ramp space for transients, with a taxiway handling the overflow. Despite the traffic numbers, operations were smooth going in and out; on Monday morning, jets at PDK were allowed to leave before their slot times. Meanwhile, the only maintenance issue FBOs reported to AIN was a tire change on a Gulfstream. But the smooth operations may have been partly due to lower-than-expected volume. Several FBOs reported some aircraft operators made and paid for multiple reservations through different FBOs to get favorable slot times—some using an arrival slot at one FBO and a departure from another. FBOs expected more traffic than they received, and in some cases blame the slot reservation system. Hamby noted the Kentucky Derby, which draws some 750 aircraft, and a Notre Dame home football game, which can draw 250 to South Bend, Indiana, along with many other high-traffic events are staged smoothly without slots. FBOs charge a special-event fee at such times—at prices similar to the Super Bowl reservation fee—to cover the cost of the extra personnel and equipment brought in to handle the traffic.